I popped out to the farmers’ market on my lunch break and came back with a good haul, albeit mainly of meat. We’re planning on buying half a lamb from the chap we bought the side of pork from back in February, so we got some chops to make sure we like it 😉 and also picked up some sausages and stewing beef. Also came home with a couple of rabbits, which I’ve never cooked before, but apparently you can just substitute them for chicken in recipes. Found some bread which wasn’t too expensive and saves me having to make some. All good. 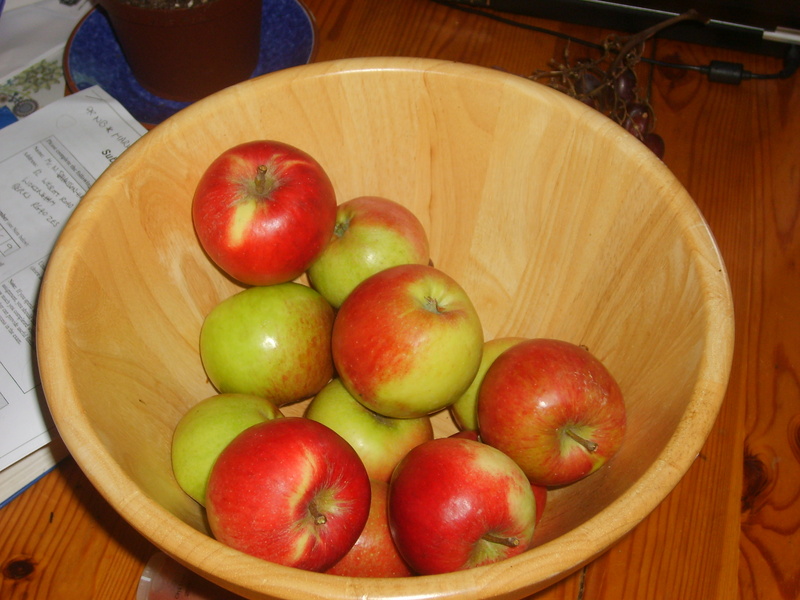 And loads of apples. He didn’t have any spartans, which are my favourite variety, so I just got a big mixed bag, which has the benefit that I get to try lots of different kinds (I have a space at the back of my gardening notebook where I write down varieties of things that Scientist Boyfriend or I particularly like, although so far our putative orchard is just going to consist of spartans), but the unfortunate drawback to this plan is that I don’t know what kind any of them are. And a bottle of gingery stuff. According to the skilled salesman’s patter, (I’m such a sucker for free samples and people who are genuinely enthusiastic about what they sell) it has a myriad of uses – drunk chilled, hot, with lemonade, with spirits, stewing fruit, frozen as ice cubes for Pimm’s. Entry filed under: food, local food. Tags: local food.